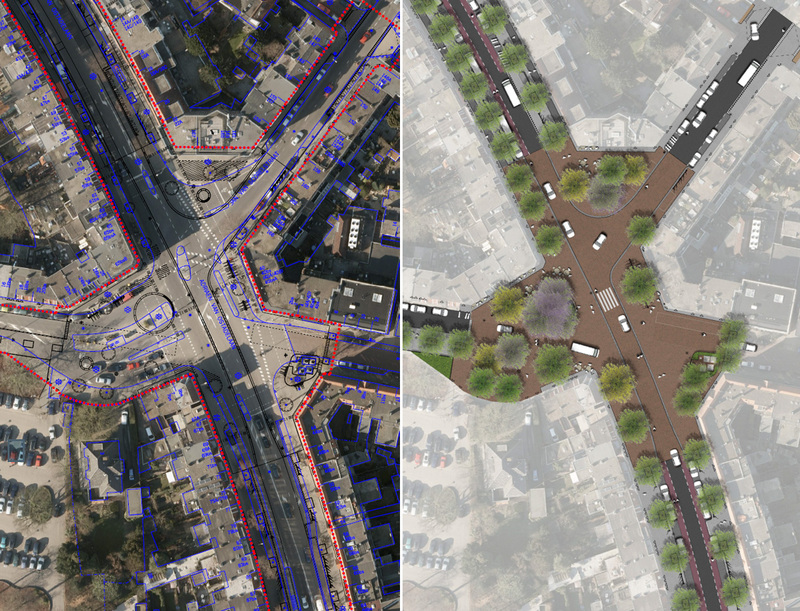 Utrecht has reconstructed a complicated five-arm junction. While it had been designed to suit the needs of the car for decades, it has now been reconstructed to be a place for people. 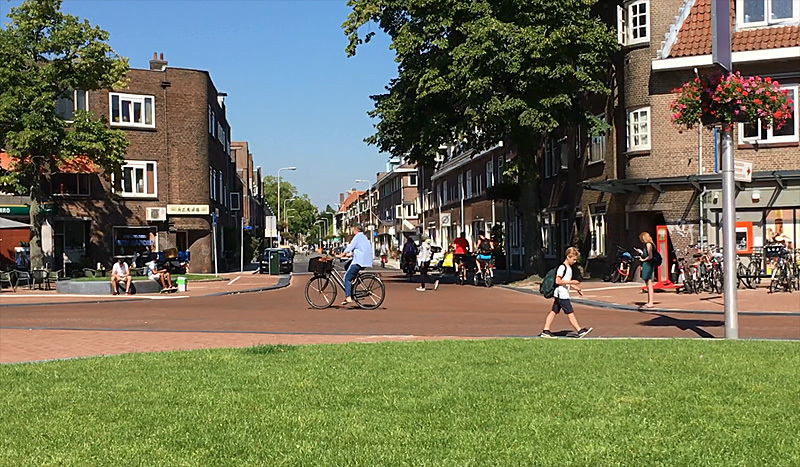 Traffic can still get through the intersection, but especially motor traffic now needs to behave as a guest in an area that is used by people first. The corner of Adriaen van Ostadelaan with Jan van Scorelstraat has become a very lively and people friendly place. The Utrecht Adriaen van Ostadelaan and its five-arm intersection looked like a relic from another era. Multiple car lanes and traffic lights were needed to organise the traffic going in the five different directions. Most of the available space in the area was used for motor traffic lanes, a bit for incomplete cycle lanes and the least bit (that was left over) for the many pedestrians in this area. That there are so many pedestrians is because there are a lot of shops and they are in turn there, because this is a residential area that also has a number of schools and an important large hospital. It was very understandable that the city of Utrecht wanted to change this location, so it would be much more in line with current views of city planning. Utrecht has determined that the private car is the least wanted type of traffic in the city. In a large part of the city centre the car is completely banned, but in the residential areas it is tolerated as a guest. That means the urban space is not designed for the car, but every location can still be reached with one, even though it may not be the most convenient type of vehicle to use. This intersection was designed for the specific needs of the car, therefore it had to be changed completely. The changes were designed by the city in close cooperation with residents and entrepreneurs in the area, who were involved from a very early stage in the planning phase. The traffic signals have been removed and the speed limit was lowered (from 50 to 30km/h). The traffic lanes have been narrowed, but the width is still sufficient for a smooth traffic flow. The sidewalks were widened and now have tree areas, seating places and more green. Pedestrians can now cross the traffic lanes wherever they please. Tactile paving indicates routes for people with reduced eye sight. The bus stops have been reconstructed and are now usable for people with disabilities. School children can now cross the street more easily. The reconstruction took place between February and June of 2016. It is finished, but for the new planting areas. Trees and shrubs will be planted in the final months of this year. The implications of these changes were thoroughly discussed in the planning phase, well ahead of the construction works. Many people had concerns about the motor traffic volume. They feared there would be too much motor traffic for a 30km/h zone. With such high volumes people consequently feared congestion on the intersection when the signals would be removed. But the city had simulations made that showed things would be possible. In relation to the traffic volumes, people also had concerns about traffic safety. In a 30km/h zone traffic is mixed; there is no physical separation of cycling and motor traffic. Moreover, all priority regulating signs are to be removed in such a zone, because priority is regulated by the default traffic laws. That means that priority goes to traffic coming from the right. Another point, raised by some residents and also the Cyclists’ Union, was a fear that motor traffic would be speeding, making the new situation dangerous for walking and cycling. That is why people demanded traffic refuge islands, speed humps, zebra crossings and more signs informing about the speed limit. The city had to dismiss most of these demands, because they would go against the very nature of a 30km/h zone. Zebra crossings could have drivers think pedestrians could only cross there, but the city wants to give people the right to cross the streets everywhere. Reason for the very low kerbs (curbs). It is because there are no regulations and safety measures, such as traffic islands, that road users are forced to be careful and forced to take other people into account. Buses need the full width of the now very narrow road way to make a turn. That can mean approaching traffic may have to wait for it. Another indication that this is no place for through traffic. To meet people half way, as a concession, one zebra crossing was planned in a central location, in front of the supermarket, but people are still encouraged to also cross the streets where they want. There were also concerns regarding cycling. People feared the narrow lanes and the mixed traffic would be a bad combination. The local chapter of the Cyclists’ Union asked to create separated cycle lanes instead of mixed traffic. They also wanted a surface of asphalt and not pavers, because the latter can be very slippery during wet weather and when there is frost. The Cyclists’ Union also had the opinion that not enough bicycle parking racks were planned. The city responded it will monitor the demand to see if more racks are needed. I think we can already establish that is the case. When I was there to film, quite a number of bicycles were parked on kickstands in the open space. Because several had fallen over it gave a very cluttered impression. 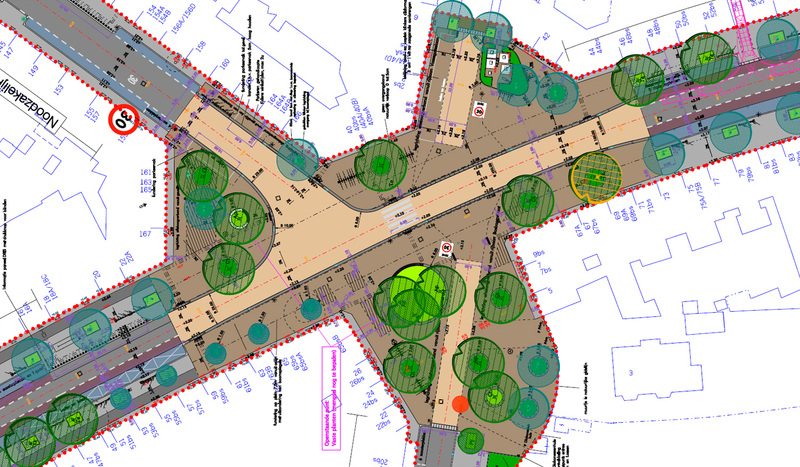 Not at all fitting with the rest of the very nice new street design. Bicycles parked on their kickstands have fallen over. A clear sign there are not enough bicycle parking racks. Note the planting area in the foreground that has no planting yet. That will be taken care of in the planting season, which is in the last months of the year. At the same time, they also asked if deliveries could still take place in a convenient way and the answer was yes. There is even space for a truck with a length of 18 metres (!) to deliver goods for the supermarket. The shop owners also asked if the reconstruction could be done swiftly, so the shops would be reachable soon again. It took a few months to build though, and now a few months after the reconstruction was opened, we can already have a look at the first reactions. Video showing 3 minutes on the 5-arm junction after reconstruction. The city had already warned that some time would be needed for people to adjust to the new situation, but through traffic will realise it has no place here. The motor traffic volume could be reduced further when the entrance to the hospital parking lot would be relocated. The other side of the hospital terrain borders on a main road (Rubenslaan). Both the city and the hospital are in favour of such a change and they are talking about how that could become a reality. This would reduce the traffic volume in this location dramatically. It would also mean this location would really only be used by locals who know how to behave here. On the other hand, it is also a matter of getting used to this type of design. 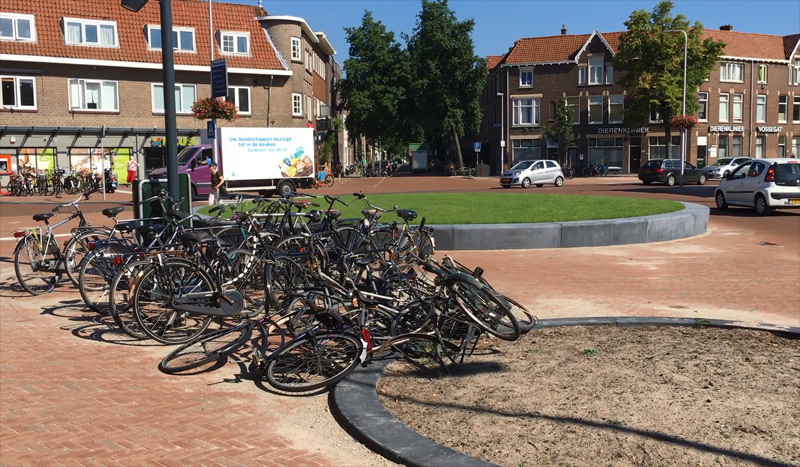 Because Utrecht – like many other cities – is building more and more of such locations, people will learn to read them better than they do now. Motorists have long been the dominant type of traffic; they are not giving up that role easily. 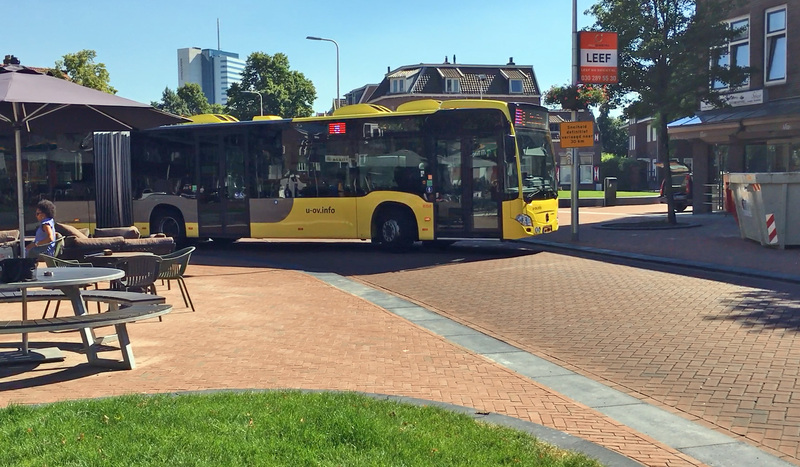 However, under the current mobility policy, Slimme Routes, Slim Regelen, Slim Bestemmen, they simply no longer get that role, so sooner or later motorists will have to get used to it and find alternative routes that are better suited for them. It will make the city space so much better. We are seeing the first glimpses of such a better place already. Not only here but also on Mariaplaats, Domstraat and other places that I will show you in future posts. Video showing the same bicycle ride through the 5-arm junction, before and after the reconstruction. It’s standard practice in the U.S. that every intersection has either stop signs or traffic signals. Here’s a protected bicycle intersection design that was installed in Texas that has no stop signs or traffic signals and Luminescent Green bikeway markings (green is the designated color for bike lanes in the U.S.). I jumped to the conclusion that this intersection doesn’t use stop signs. The second photograph shows an outline of a stop sign at the intersection. The space that would normally be devoted to a right-turn only lane for motorists, in cities such as Los Angeles, was used to create a protected intersection for cyclists. The ‘after’ video is obviously heartening, but there’s a behavioural layer evident even in the ‘before’ shot that I suspect is essential to making house work so smoothly. The mother and children don’t bother wearing helmets because the cars slow right down and give them a wide berth when overtaking, for instance. 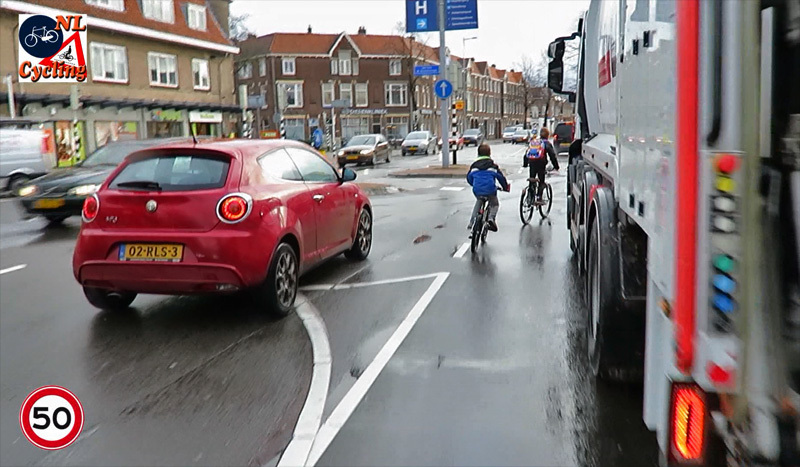 Likewise, when the red car wants to park, it doesn’t feel compelled to drive around the cyclists and them immediately pull up in front of them (all too common in the UK). The respect and education of drivers is an essential part of the infrastructure. To illustrate differences in how the U.S. views cycling, here is a blog post from Metro, the Los Angeles county transit agency, that shows the city of Santa Monica’s solution to potential conflicts between cyclists riding along a bike path and pedestrians that might be walking on a sidewalk that crosses the path. Notice that there are light-rail tracks that run parallel, and to the right of, the bike path in the picture. The speed of the train requires that there has to be crossing gates for motor vehicles at the intersection. The city of Santa Monica has by far the highest bicycle commuting rate in LA county at 5%, which is one of the highest rates in the entire U.S.
Obviously the Utrecht Municipality found a more pragmatic solution than shared Space to coordinate Traffic which is more or less a sacrifice to car traffic so that pedestrians and bicycle riders dont need to be prioritized. This example shows how smooth Traffic works even when cars are only guests. Thank you (once again) for this video! I went there this afternoon to observe this area sitting on the terrace. The whole atmosphere of this place is improved, but there were a lot of cars (outside of rush hour) and not many bikes. I don’t mind biking here & it is great that the traffic lights are gone. But once you have passed this part and you are on the seperate bike path again, the travel becomes more relaxed. But still an improvement over the old situation. The before and after video seems to show a substantial reduction in motor traffic, but the article it didn’t mention that any motor traffic diversion had occurred. Was this a natural byproduct of through-drivers finding a different less pedestrianized route? Or was this a quirk of traffic patterns and filming days? I really enjoy your blog even if my experience in Virginia is….different. My local bloggers and advocates are very much motor traffic vs. bikes vs. people vs. public transit where everyone is advocating that someone else suffer. I really appreciate your blog giving a more holistic perspective. Interesting how segregation is not being used here, but the nature of the road is being redefined. I’d be very interested in revisiting this area in 1 year. I have a feeling that pedestrian/cycling injuries will be up. I think the first comparison video slightly misrepresents the amount of car traffic after the reconstruction. The later videos show (what I feel like) are more representative amounts of traffic. The difference for example with Mariaplaats is that this road does form a distributor road from Rubenslaan into the whole residential area, and connects it to the North via Burg. Reigerstraat and roads along Wilheminapark. Although this reconstruction is a clear improvement over the (very) old situation, I clearly understand the worries of the local residents over car traffic volume. It makes me ponder if this was the best solution. What is an 18 metre long truck doing here? Couldn’t a 6 metre long van or at the most a 10 metre long 7.5 tonne truck deliver goods here? How long do reconstructions of various things like roundabouts, downgrades, cycleways, and in this case, 30 km/h zones, typically take? And how do the emergency services get here effectively? These long trucks are typically used for (some of) the resupply supermarkets in The Netherlands. Indeed from experience (having worked in a supermarket as high school student), a once per day resupply would not fit in smaller truck, so I understand that the supermarket prefers to keep the big trucks. Reconstruction works: I think it depends very much on the extend of the works, but I’d say that for e.g. a roundabout it should be on the order of 1-2 months, with the place being shut for traffic maybe for a shorter period. Emergency services can still enter this area, I don’t see a problem here. I wonder whether more lateral deviation would have helped to reduce speeds? Currently that looks very straight without many vertical elements close to the carriageway. 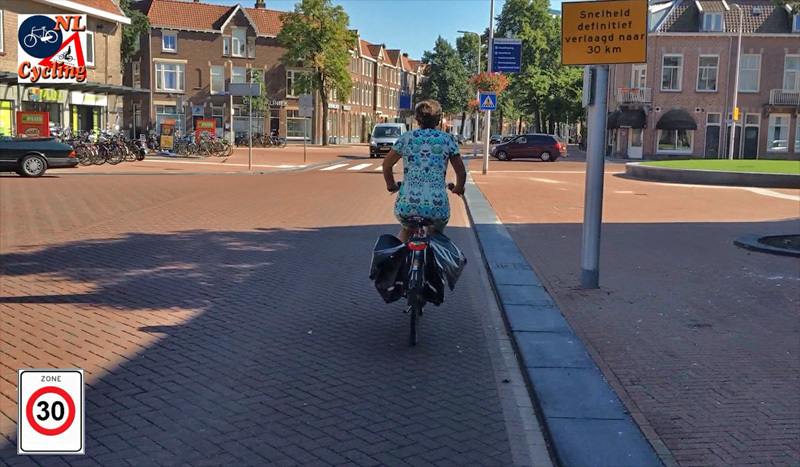 This entry was posted on 27 September 2016 by Bicycle Dutch in Original posts and tagged before and after, ride, urban design, Utrecht.